I've recently noticed that I am becoming more and appreciative of a perfect black wall. What used to seem so dark, dreary, and depressing when it came to interior design, now feels almost as clean of a slate as a spotless white. When black walls are decorated with contrasting colors and elements, it creates a sense of warmth that I have yet to find in different colors-it is also much more unexpected. The image above features a black wall in an office-like setting, but black is such a versatile color whether in clothing or design, and could work well in any space. Don't worry, though, if you don't feel quite ready to make the leap over to the dark side (ha), this is a key opportunity to test out a black accent wall. Who knows, you might just fall in love with it. 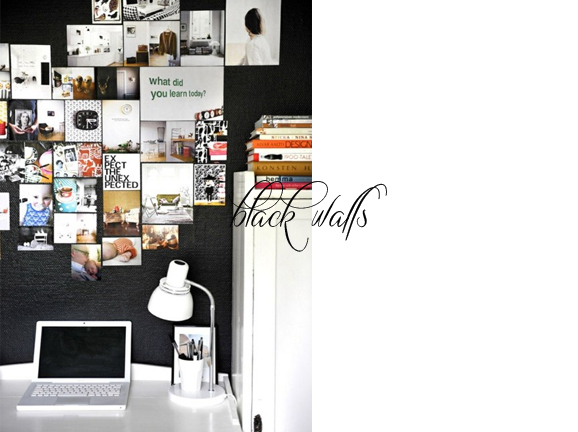 What are your thoughts on black walls? Love 'em or hate 'em?